The world’s leading smartphone maker has posted its first operating profit decline in nine quarters, owing to increased market competition and slowing momentum, most notably in emerging markets. However, Samsung‘s lacklustre mobile performance will likely be cushioned in the short-term by its buoyant television business, which is widely expected to pick up pace amid the World Cup period. The company’s first quarter results were largely in keeping with forecasts, as group sales overall fell nine percent and net profits rose 5.9 percent year-on-year – equating to $7.3bn. However, ambitious projections at the beginning of the year were scaled back one month ago, as the market for high-end smartphones was discovered to have dropped off somewhat. As a consequence, sales at the group’s IT and Mobile communications division plummeted four percent on the previous quarter. Investors will be keeping a close eye on Samsung’s mobile arm in the immediate future, given that it accounts for over half of the company’s overall profits. Without any new products or major innovations to speak of, there was very little to drive Samsung Electronics’ profits forwards through the first quarter. The release of the company’s long-awaited curved and bendable displays, however, should spell the beginning of a positive stint for Samsung in the second quarter. Samsung’s results contrast quite sharply with Apple’s, which exceeded analysts’ expectations last week, owing to unusually strong mobile performance. 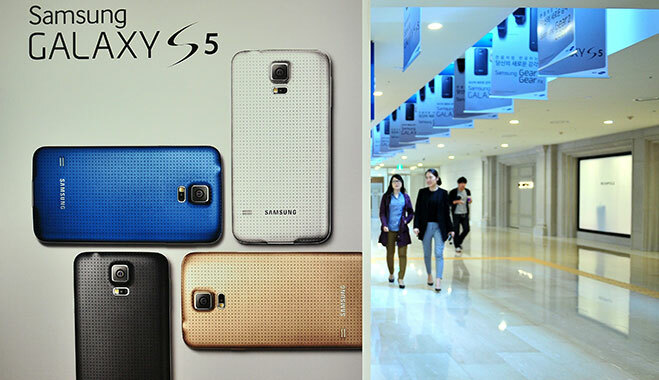 Sales of Samsung’s Galaxy S4 have slowed by quite some margin, with many consumers looking instead to the iPhone 5s and 5c, and Asian buyers opting instead for much cheaper models. China is today the greatest opportunity for those in the mobile business, as consumers there look for an affordable though no less capable model of smartphone. With Apple having signed a deal with China Mobile, it looks as though Samsung’s efforts to occupy a large chunk of the market have taken a hit, courtesy of the California-based tech giant.